The road to Privatisation in education? “Defund, make sure things don’t work, get people angry, you hand it over to Private capital”- Noam Chomsky. This is the view of historian and economist Noam Chomsky on the standard model of neo-liberalism in privatisiations. This argument is currently being used more for how the NHS is being treated but is education really that far behind? Since 2015 when the Conservatives won a Parliamentary majority, the number of schools in deficit has risen from 8% to 18%. This is a huge number of schools that are dipping into reserves, making staff redundant or cuttiing down on resources. 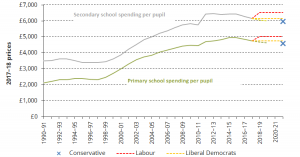 The graph below shows spending per pupil in both Primary and secondary schools over the last 25 years. From 90-97, under John Major’s conservative government, spending broadly remained flat. Then from 97-2010, spending increased hugely under Tony Blair and then Gordon Brown’s Labour Governments. Now, this money may not have been spent completely wisely or efficiently as I hear some Tories say but few people say spending money on education is a bad thing. In Economics we call it a “supply side policy” or basically an investment. The country spends money now so that workers of the future have higher skills, produce more and earn more money. Simple. I would also argue that this large increase was due to 25 years of under investment by Tory Governments in buildings, resources and staff wages that were all hugely neglected and had left education in a crumbling state come 1997. From 2010-2015, education spending is broadly flat under the coalition Government, so maybe the Lib Dem’s did tame the Tory free marketers in education. Then from 2015-17 education spending per pupil falls, for the first time since the mid 90’s. No wonder many young people and parents of young people believe this Government doesn’t care about them. Then there are predicitions based on the parties 2017 manifestos, only Labour said they would increase education funding. 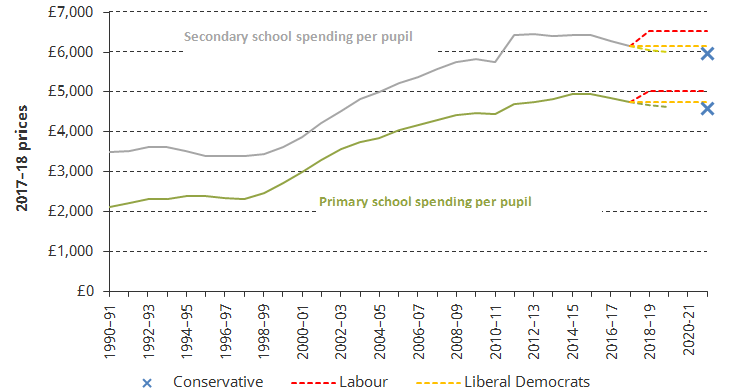 In short, the Tories have not increased education spending in around 20 years of Government. A shocking endigtment. But, a spokesman from the Department of education says “The Government is spending £40bn more in 2016-17, the highest amount on record”. This claim is frankly laughable. Well not the claim, but what it hides. Let’s take a family of 3, 2 parents and 1 child. Currently they spend £250 a week on shopping. A second child comes along and now they now spend £251 a week on shopping. This is the highest amount ever!! True but this in no way reflects the true cost reality, and this is what schools are facing. Below is the only graph that matters when it comes to this. Spending PER PUPIL is to fall by nearly 10% between 2015-2020. 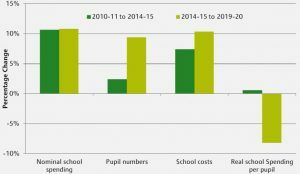 The other bars show why, pupil numbers have jumped considerably, as have costs such as the apprenticeship levy and national insurance contributions that Government has placed on schools. The Government was also fond of saying that “Budgets have been protected”, at worst this is an outright lie, a clear deception at best. The overall (nominal) budget remains broadly the same for 5-16 education, but this does not include the cost increases pointed out or post 16 education. These budgets therefore have been cut. Why do our 16-18 year olds deserve less than their predecessors or those in the year below them? The excellent NUT campaign at this year’s election pointed this out and poll numbers as well as my own experience on the doorstep show that parents felt the same. So spending has gone down, only the most deluded or Tory amongst people will deny this. But what about the rest of the developed world? I’m not a great fan of international comparisons, PISA tests are not a reliable comparison, and anecdotal stories of great education systems in Singapore or Finland are just that really. Every countries context and circumstances is different. But we can compare how much each country spends on education as a proportion of GDP. GDP measures what a country produces each year so its equivalent of saying what percentage of your income per year do you spend on housing say. Below is the OECD (major economies) and what % of their GDP they spend on education. The UK is 18th below the OECD average. But it is something else about the graph I’d like to focus on. The blue bar is the amount spent on private education. The UK’s is around a third of overall spending, higher that the “free market” USA. Part of this is the UK’s historic class system and huge private school fees for the top 7% of the population. But part is also the fragmenting of schools. Academy chain bosses can now pay themselves large salaries. Schools can “buy in” services. Parts of schools are contracted out. All of this is money that you pay in tax and is finding its way to private shareholder hands to educate your children. I received a brochure through the post recently in my role on the Council’s education committee from a company that provided “education solutions”. It was a glossy 8 page booklet that I read from cover to cover several times. I had no idea what they actually did. They introduced their team, a lawyer, a marketing manager and yes some ex teachers, but I had no idea what “solutions” they provided. Is this the future? 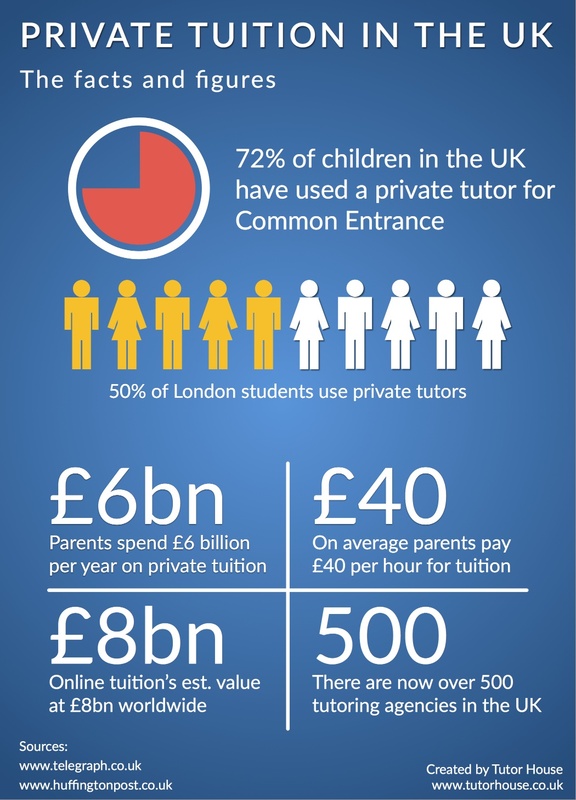 The other part of this private education spend is on the explosion in private tuition. I am in no way speaking out against tuition, I have been a tutor for students in the past and I know that many of my students have used a tutor and found it useful. But the graph below demonstrates many interesting things. Firstly, tutors are used to get into grammar schools. One of the Tories great policies for social mobility does nothing of the sort and they know it. You need to pass a test to get in and those with the most money and sharpest elbows will always find a way to boost their child’s chances in this. The graph on the left also says that the average fee per hour of tutoring is £40. To put this into context, the minimum wage per hour is £7.50. I know many parents struggle to get their kids the best education, some working all the hours God sends to fund a private school place or private tutor and I am not knocking that. 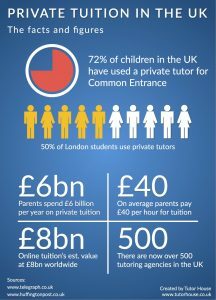 But the more there is a creep or expectation of private tutoring, the greater the gap will become because many cannot afford this. 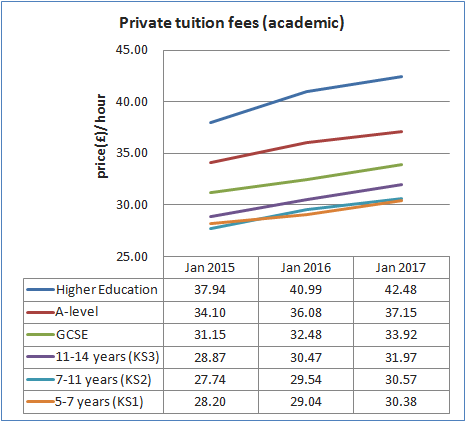 The graph on the right below shows that to tutor a 5 year old, people are charging £30 an hour. Just think about that, a FIVE YEAR OLD! After school they are not playing, discovering, enjoying life, they are being tutored. To me that is frankly ridiculous but is part of a culture where all that matters is exams, even at key stage 1. I don’t know if this is or was a great plan by Cameron and now May to defund the education system so much that privateers step in. But it is what is happening. Chomsky said people get angry as the service fails, I would like students and parents to get angry. But not at the schools or teachers, I’d like students and parents to get angry at this Government who have wilfully underfunded and fragmented education. This entry was posted in Opinion on September 17, 2017 by Ashley Pearce.